Squirrel cage motors are the most commonly used induction motors, but the main drawback in them is their poor starting torque due to low rotor resistance. (Starting torque is directly proportional to the rotor resistance). But increasing the rotor resistance for improving starting torque is not advisory as it will reduce the efficiency of the motor (due to more copper loss). One can not even add external resistance for starting of purposes, as the rotor bars are permanently short circuited (Construction of a squirrel cage rotor is here). These drawbacks are removed by a double squirrel cage motor, which has high starting torque without sacrificing efficiency. 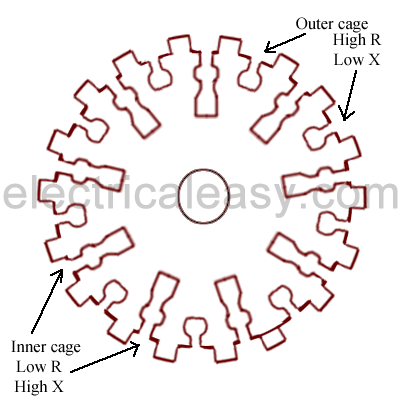 Rotor of a double squirrel cage motor has two independent cages on the same rotor. The figure at left shows the cross sectional diagram of a double squirrel cage rotor. Bars of high resistance and low reactance are placed in the outer cage, and bars of low resistance and high reactance are placed in the inner cage. The outer cage has high 'reactance to resistance ratio' whereas, the inner cage has low 'reactance to resistance ratio'. At starting of the motor, frequency of induced emf is high because of large slip (slip = frequency of rotor emf / supply frequency). Hence the reactance of inner cage (2πfL where, f = frequency of rotor emf) will be very high, increasing its total impedance. Hence at starting most of the current flows through outer cage despite its large resistnace (as total impedance is lower than the inner cage). This will not affect the outer cage because of its low reactance. And because of the large resistance of outer cage starting torque will be large. As speed of the motor increases, slip decreases, and hence the rotor frequency decreases. In this case, the reactance of inner cage will be low, and most of the current will flow through the inner cage which is having low resistance. Hence giving a good efficiency. When the double cage motor is running at normal speed, frequency of the rotor emf is so low that the reactance of both cages is negligible. The two cages being connected in parallel, the combined resistance is lower. 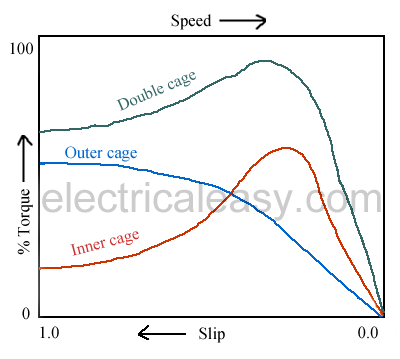 The torque speed characteristics of double squirrel cage motor for both the cages are shown in the figure below.